Wage theft is an endemic problem in the workplace. It’s everywhere, and chances are that one or more places we all frequent has engaged in some form of it. In most cases, workers who are owed wages and want to hold their employers accountable face difficult obstacles. Workers know that reporting unlawful activity could result in their immediate firing, demotion, harassment, deportation, blacklisting, discrimination, and more. Employers often do not keep the records they’re supposed to keep, making it difficult to prove violations. NELP is at the forefront of designing state and local policy solutions to expand worker protections, raise industry standards across low-wage labor markets, and build robust enforcement systems that translate policy wins into real improvements in workers’ lives. Guide (available in 5 languages) outlines best practices for business owners in event of immigration action. MSNBC: How can consumers combat wage theft? 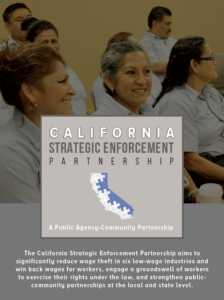 The California Strategic Enforcement Partnership aims to significantly reduce wage theft in six low-wage industries and win back wages for workers, engage a groundswell of workers to exercise their rights under the law, and strengthen public-community partnerships at the local and state level. Watch a video by Public Welfare Foundation featuring NELP’s Chris Owens, executive director, and Laura Huizar, staff attorney, who explain wage theft and what workers and advocates are doing to fight it. 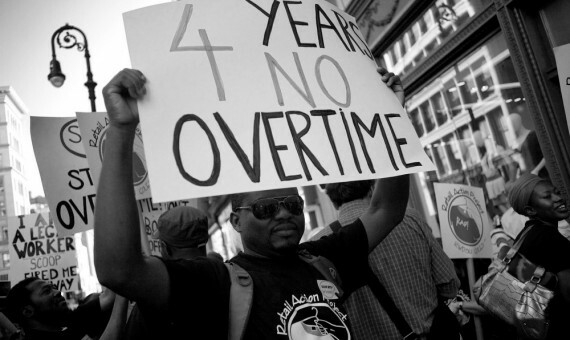 In this guide, our goal is to support and build upon the surging grassroots energy around wage theft campaigns in cities and states across the country. Advocates are using high-profile street protests and new organizing strategies to target unscrupulous employers. They are mounting multi-year campaigns to update legal protections and set up new enforcement mechanisms. And they are pushing the issue of wage theft onto the airwaves, educating the public and lawmakers alike about the scale of the problem and how to fight it. In the process, they are creating strong, enduring coalitions of worker centers, unions, legal services groups, policy think tanks, and other low-wage worker advocates. By providing our allies a concrete menu of innovative policies to strengthen enforcement of minimum wage and overtime laws—as well as strategic guidance on identifying which policies make sense in a given community—our hope is that we help turn the tide and shift the American workplace from wage theft to wage justice.